Expérience d'une journée entière des sites les plus emblématiques d'Agra pendant ce lever de soleil du Taj Mahal et excursion d'une journée au Fort d'Agra depuis Delhi. 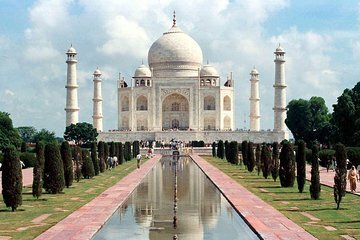 Voyage dans le confort climatisé à l'une des principales attractions de l'Inde - le Taj Mahal - et regarder le soleil se lever sur ce monument à l'amour. Tour Agra Fort avec votre guide professionnel et visiter les marchés locaux pour un avant-goût de la vie quotidienne. L'attention personnalisée et le transport privé assurent que ce voyage unique soit une expérience mémorable. Sadly our sunrise trip to the Taj Mahal with Viators local tour company was a disappointment. I will say up front that we contacted Viator about our experience and they handled things perfectly. The Taj was awesome of course and the Agra Fort equally impressive so yes definitely go there. But as for getting on the road at 2 am to catch a sunrise - I wouldn't bother unless you can be sure that the ever present 'fog' is clear. Apparently in winter months it's unlikely to be clear skies. While I enjoyed seeing the Taj Mahal and Agra Fort and have no complaints with the transportation to/from Delhi, I am extremely disappointed with what I felt to be extreme pressure to shop and buy things at various stores in Agra I am assuming that my tour guide, and possibly driver, received a commission off of the sales. When my tour guide asked me if I wanted to see some art, I had assumed that it would be in a museum or gallery, akin to the other sites that I had been seeing, not shops that would be selling mass-produced hand-woven rugs, pashmina afghans, sarees, etc. I had expected that I would spend my day taking in the sites of Agra and having a good meal or two in the city before returning to Delhi, not spending most of my day being transferred to various stores sometimes without my knowledge until we had arrived and being told to go in and take a look before receiving long-winded sales pitches by friendly sales people, eager to dupe an American into buying overpriced merchandise.